If you dream of an enchanting stay in the idyllic setting of Drôme, this beautiful holiday home with private pool is the one for you! You will fall in love with the blue waters of the splendid swimming pool and the spacious and bright interior with its elegant and relaxing atmosphere. You will enjoy being together with family or friends in the spacious lounge to spend good moments. To enjoy the beautiful sun, you can choose between tanning in the water in the pool, basking on the terrace or just sitting in the lovely garden. 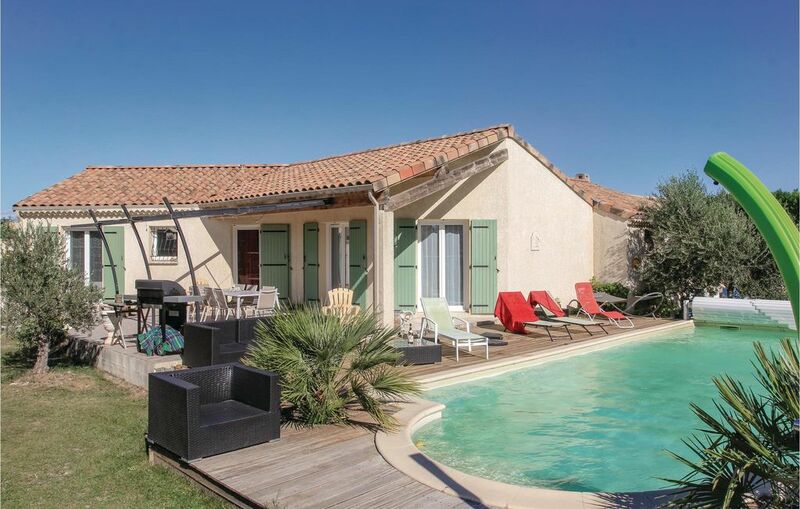 Located in Pierrelatte, this is the ideal holiday rental to visit Drôme but also the neighboring Ardèche and Vaucluse. At Pierrelatte you can take the children to discover the famous Ferme aux Crocodiles. Do not miss the Musée Yvon Guéret set in the 17th century prison built on the ruins of Pierrelatte Castle. For the more athletic, go to Bollène (12km) to try tree climbing. Golfers will improve their swing on the course of Clansayes (8km) and you can also enjoy water activities on the Lake located 5km. Make sure to discover the very pretty site of the Val des Nymphes (6km) and the perched village of La Garde Adhémar or Saint Restitut with its unusual cellar cathedral which will delight the amateurs of good wines. To discover fabulous landscapes, continue your journey to Ardèche on the tourist route of the splendid Gorges de l'Ardèche with the Pont d 'Arc and the Grotte Chauvet. Many other beautiful surprises await you so do not hesitate and book this beautiful vacation rental with private pool.